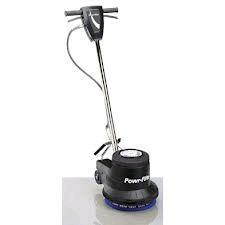 This 13" 1 hp Classic Floor Machine is a great all-purpose floor machine for use in smaller areas. 175 RPM is considered the most versatile speed for floor machines, allowing you to complete a wide variety of jobs - including scrubbing, buffing and polishing. * Please call us for any questions on our 13 inch floor polisher rentals in Kokomo IN, Logansport, and Central Indiana.